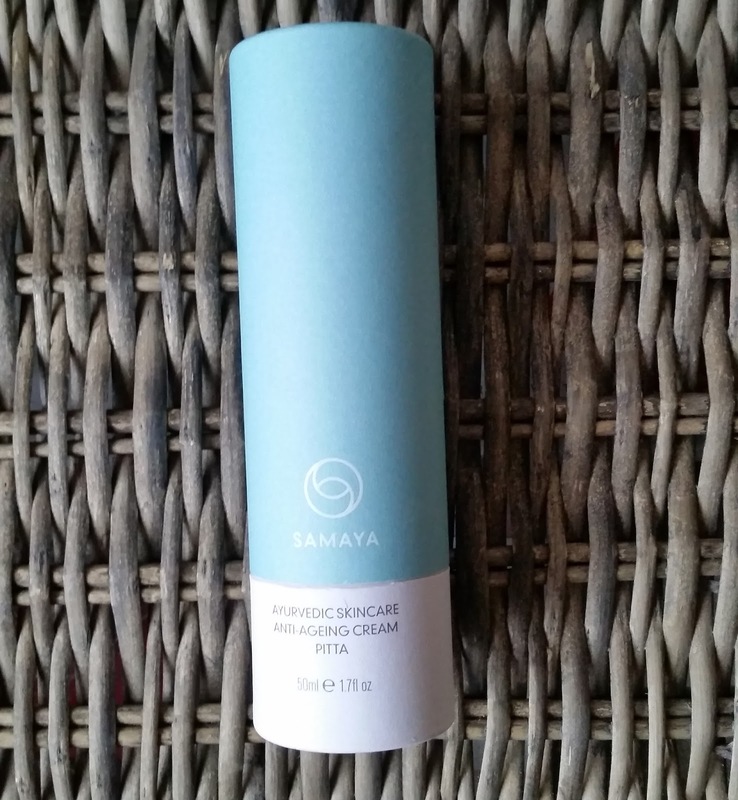 Home / SkinCare / SAMAYA - Dosha Skincare - Discover Your Dosha. 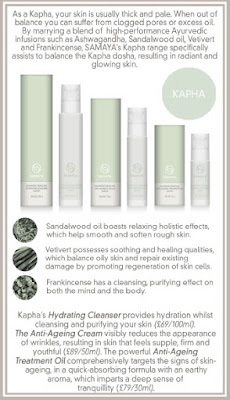 SAMAYA - Dosha Skincare - Discover Your Dosha. Achieving balance in our lives is a hard task and when your out of balance, your skincare and other factors can suffer. SAMAYA offer a new revolutionary dosha skincare range that has seen the brand be shortlisted for best new natural product and packaging design of the year in the beauty awards 2016. 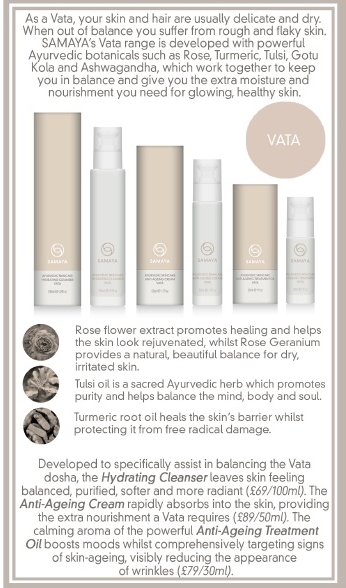 SAMAYA, based on Ayurvedic principles is perfect for those looking for natural skincare that gives radiant skin as well as helping you to achieve perfect balance and wellbeing. "We are used to seeing skincare that combines natural ingredients with effective results – but what about a range that also provides a wellness benefit? 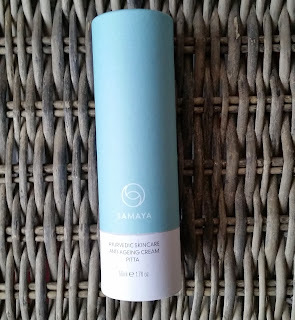 Formulated in accordance with Ayurvedic principles, where ingredients are chosen for their ability to pacify and balance particular types of constitutions, SAMAYA is a high performance holistic skincare brand that also aims to help you achieve wellness and the perfect balance in your life….isn’t that just what we need to help combat the hectic modern lifestyles we lead?" SAMAYA curates the finest authentic elements of Ayurveda, marrying them with clinically proven natural ingredients to provide effective skincare through a relaxing, holistic experience. The range includes three luxurious products, a rich Hydrating Cleanser, a powerful Anti-Ageing Cream and an indulgent Anti-Ageing Treatment Oil, all of which contribute to healthier, radiant looking skin. Each of the three products boasts a unique aroma that brings calm and serenity through the SAMAYA experience, designed specifically to help balance the individual doshas. 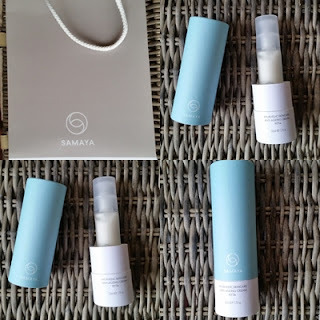 Botantical ingredients which are free from parabens and synthectics, each range has a unique aroma that brings calm and serenity through the SAMAYA experience. At the core of Ayurveda lies the concept of achieving harmony between the mind, body, and soul. When these three elements are in balance with each other, you will be able to feel the positive effect on your health and well being, and in the radiance of your skin. Discovering your dosha is really important to help find the right products that will help not only your skin but your mind, body and soul. 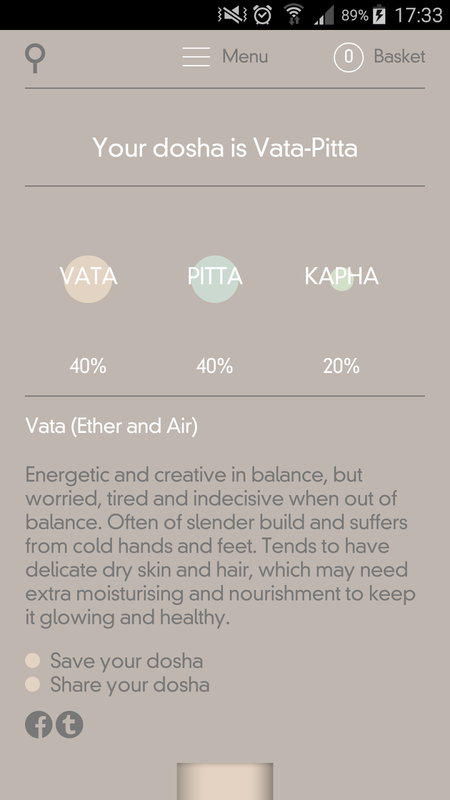 Answering a few questions will establish which dosha type you are and will guide you for using the exact products matched to your dosha category. 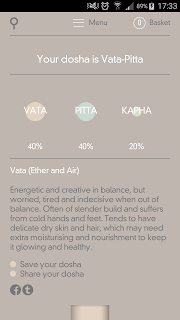 Are you Vata, Pitta or Kapha? Discover Your Dosha! As you can see from the picture, my test results show that i am Vata-Pitta which is extremely rare to match in both categories. Energetic and creative in balance, but worried, tired and indecisive when out of balance. Often slender build and suffers from cold hands and feet. Tends to have delicate dry skin and hair, which may need extra moisturising and nourishment to keep it glowing and healthy. Well-proportioned and compact build, with a focused mind and love of order. Confident and passionate, enjoying challenges. Prone to anger and impatience when out of balance. Benefits from gentle skincare as skin can be sensitive and irritable, susceptible to wrinkles, sunburn and inflammation. Laid back and easy-going with a stable, steady energy level. Often has a strong physical frame but can be lethargic or apathetic if out of balance. Takes a relaxed, reasonable approach to life and can be compassionate, gentle and kind. Skin is usually thick and pale, can be radiant and glowing, but with clogged pores or excess oil when out of balance. I was kindly sent the anti-ageing cream from the PITTA range and was surprised on how good the packaging looks, it sets itself apart from any anti-ageing cream on the market. The anti-ageing cream is situated in a pump glass bottle that sits safely upright in its cynlinder tube packaging. On the packaging is a description of the product and how to use, with also the ingredients listed, in case you want to check these. What is great about the packaging is once you have finished using the cream, you can then pop it back into the tube, and it will be safely stored and out of sunlight until its next use. 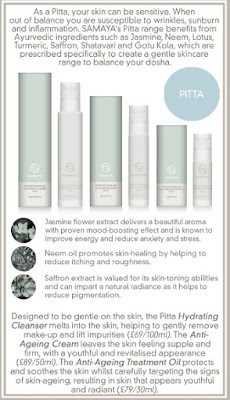 Apply the PITTA anti-ageing cream to cleansed skin morning and night using massaging circular motions. The cream glides over the skin with ease and instantly absorbs leaving your skin soft, supple and cared for. The creams consistency is not heavy at all and is quite light which helps your skin breathe and not feel like you have a product just sitting on your skin. I was surprised at how amazing the anti-ageing cream keeps your skin moisturised throughout the day whilst delivering a healthy glow and a more awake appearance to your skin. Perfect for the winter months where the cold weather combined with central heating can take the moisture out of your skin and your then searching for a product to moisturise and protect. The aroma, jasmine flower extract, when applying the anti-ageing cream is heavenly and instantly boost your mood when applied to your skin. 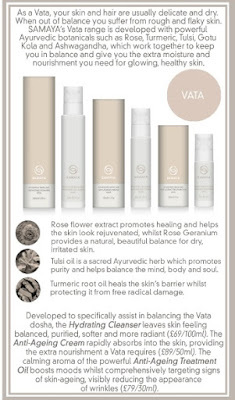 If your looking for a skincare range that not only will nurture and improve your skin but also balance your dosha, head on over to SAMAYA to start you on your journey. X Neil.